Article and Photos by Mike Stines, Ph.B. Here in the Northeast most folks eat shellfish – hard-shell clams, mussels and oysters – the way God intended: raw and maybe with a dash of hot sauce and a spritz of lemon juice. Scallops and shrimp are usually cooked and served as an appetizer or as an entrée. But smoked shellfish is becoming popular at up-scale restaurants where they are often presented as appetizers or as part of a salad or entrée. The best oysters for smoking are medium oysters with shells about five to seven inches long. Oysters shrink a lot when they are smoked, so you don’t want a small oyster. (Here in Massachusetts, the minimum size oyster that can be harvested is three inches but regulations vary in other states.) When shucked, a medium size oyster will be about three to 3 1/2 inches long. Oysters are usually named for the waterway in which they grow. On the East Coast the “Eastern Oyster” is the prevailing species, but there are scores of varieties. On Cape Cod we have Wellfleet, Cotuit, Dennis and Barnstable oysters. Because oysters are filter feeders, they all have a slightly different taste due to the difference in the tidal water. When you purchase oysters from the fishmonger they should be tightly closed. If the oyster is partially open and doesn’t close when the shell is tapped, the oyster is dead and should be discarded. Fresh oysters will keep, refrigerated, for one or two weeks—but it’s best to purchase them a day before you plan to smoke them—or the same day if you’re serving them raw on the half shell. Once you have the oysters, you need to shuck them to get them out of the shell. Shucking is not difficult but it does require an oyster knife (a dull-pointed, thick-bladed knife with a curved tip), a mesh glove to protect your hand if the knife slips, and some practice. Scrub the oysters with a stiff brush under running water to remove any mud or sediment. Oyster shells have a top shell that is more flat, and a bottom shell that is more cupped. The back of the oyster – the pointed end – is where the hinge is located. Position the oyster with the cup side down and the hinge facing you. Hold it in position with a side towel. Slip the tip of the oyster knife between the top and bottom shells by the hinge, aiming towards the bottom of the oyster. Twist the knife until the shell pops open. Run the knife along the top shell and around the oyster until you get to the other side (this severs the muscles that holds the shell together). When you reach the other side of the oyster, twist the knife to pry off the top. Keep as much of the liquor as possible. Run the knife under the oyster to separate it from the bottom shell. Collect the shucked oysters and the liquor in a chilled glass bowl and refrigerate while the brine is prepared (or prepare the brine in advance). If you’re not up to shucking oysters yourself, shucked oysters may be bought in pint containers—but that takes all the fun out of making your own smoked oysters! I use a basic fish brine for oysters and other some other shellfish. Heat one quart of water to a simmer over medium heat. Add the remaining ingredients and stir until the salt and sugar are dissolved. Remove from the heat and add the remaining water. Cool the brine to below 40 degrees F.
Pour the cooled brine over the oysters and soak, refrigerated, for 30 minutes. After brining, rinse the oysters under cold water and drain in a colander. Prepare the smoker for a 225 degrees F. cook using your favorite smoking wood (avoid using heavy wood such as mesquite). I usually use alder, apple or oak, but I’ve also used dried seaweed. Place the oysters on a porcelain grill rack or Frogmat smoking mat. (Or return the oysters to the cupped (bottom) portion of the shell and arrange them on a tray with rock salt.) Smoke the oysters for 30 to 40 minutes or until the edges begin to curl. Remove from the grill and serve warm or cool. You can also serve them cold with a drizzle of olive oil, some crushed red pepper and crusty bread. 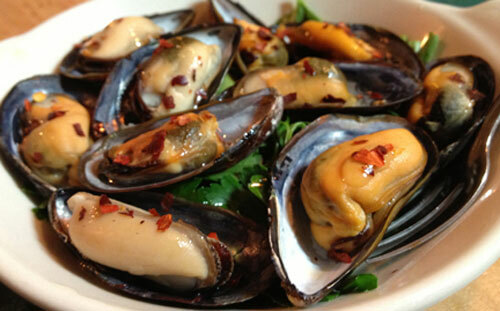 Mussels are delicious when simply steamed in garlic and white wine. This recipe combines steaming with smoking for a great appetizer. Add the wine, lemon juice, garlic, thyme and crushed red pepper flakes to a 6 1/2-quart stock pot. Fit a steamer basket into the pot and bring the liquid to a high simmer over medium heat. Scrub the mussels with a vegetable brush and remove the “beard” on the edge of the mussels (do not do this in advance, as removing the beard will kill the mussel). Put the mussels into the stock pot and tightly cover. Steam the mussels until they just open, about five to seven minutes. Drain in a colander. 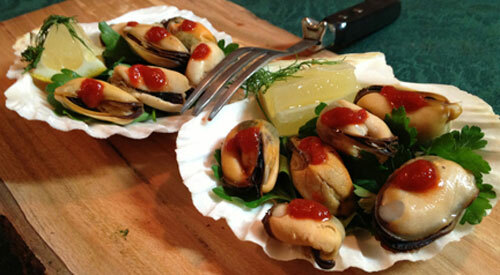 When the mussels are cool enough to handle, remove the meat from the shells—reserving the shells for presentation. Discard any mussels that do not open. Prepare the smoker for a 200 degrees F. cook using whatever wood you prefer. Smoke the mussels on a grill rack or smoking mat for 10 to 15 minutes. Do not overcook the mussels. Remove the mussels from the smoker. Place the smoked mussel in one half of the reserved shell and serve. My preference is to shuck the clams before smoking so they absorb more of the smoke flavor, but whole clams can be smoked until the shells open, about ten minutes. Fishmongers use different names for clams based on their size. The smallest harvestable clam is a littleneck (about one inch in diameter), then middleneck, followed by topneck. Larger clams are cherrystones (three to four per pound) and chowder clams. 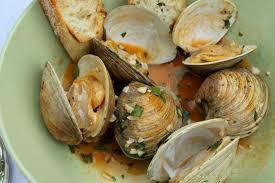 One pound of topneck clams contains about five to seven clams. Soak the clams in cold water for an hour, which allows them to purge any sand. Scrub the clams under running cold water with a vegetable brush. Shuck the clams. To shuck clams, you’ll need a clam knife (different from an oyster knife, as the tip is not curved and the blade is thinner) and a mesh glove to protect your hand if the knife slips. Experienced shuckers will just use a side towel to hold the clam. It’s easier to open clams if they have been chilled for several hours. Hold the clam with the hinge facing the palm of your gloved hand. Using the side of the knife, wedge the blade between the shells at the front on the clam. When the shell opens, slide the knife around the clam to cut the adductor muscles holding the shells together. Run the knife along the top and bottom surfaces inside the knife to free the clam. Discard one half of the shell, reserving the other half for cooking and presentation. Prepare the smoker for 225 degrees F. cooking using the wood of your choice (I recommend using maple or apple wood). Place the clams on a vegetable grate and smoke for 30 to 40 minutes. In the Western Hemisphere “scallops” are the adductor muscle from the bivalve, while in Europe and the Far East the scallop is served complete, similar to an oyster or clam. Sea scallop adductor muscles can be two inches in size, while the smaller, tenderer bay scallop is much smaller. Sea scallops yield between 10 and 40 scallops per pound. Purchase scallops that are “dry packed” —meaning they haven’t been treated with a phosphate solution to absorb moisture and increase the cost per pound. Rinse the scallops under cold water and remove the “catch,” a small muscle running vertically on the side of the scallop; pat dry. Remove the scallops from the shells and them in a mixing bowl and season with the lemon juice, pepper and salt. Prepare the smoker for a 200 degrees F. cook using your favorite wood for flavor. 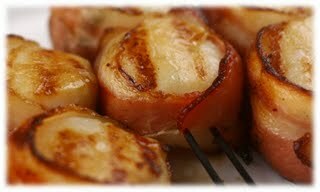 Place the scallops on a cooking grate and smoke for 30 to 40 minutes or until the scallops are just translucent and slightly firm. If you overcook the scallops they will be rubbery and tasteless.